The third UTB night, held on 22 Sept 2016, celebrated UTB's 30th anniversary, as well as Country Girls' successful surmounting of Mount Fuji. Momochi suggests that this Mount Fuji plan came about because of a casual remark she made. Momochi: Ah, next time I've got to be careful about what I say. Ozeki had to retire at the 8th station, which is why she's absent in the above picture. But she was glad that she got to climb with the rest as it strengthened their bonds. Ozeki: We've surmounted the Japan's number one peak, so the next goal is to become Japan's number one idols!! 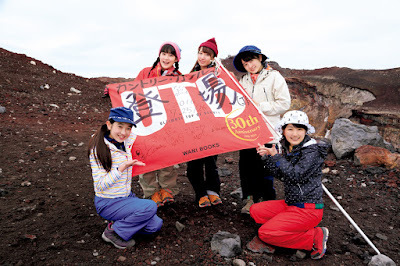 The MC of the event, Yajima Maimi, had only reached the 5th station on bike, so if Ozeki were to give surmounting Mount Fuji another go, Maimi asks that Ozeki invite her along as well.